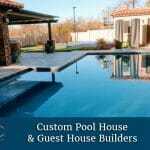 Pool House Construction in Phoenix | Edgewater Design Co.
You already have that swimming pool that’s so important to the Phoenix lifestyle, so now it is time to improve that outdoor living space even more. A pool house is the perfect way to do that while making the outdoor areas of your home more comfortable places to spend time in. In addition to bringing added value to your home, a pool house will bring added value to your lifestyle. It will provide extra ambiance to your pool and home and give you an outdoor spot for yoga, allow you to stay cool while watching the kids play in the pool, or serve as a place to entertain. No matter what you want to with your pool house, we’ll make sure it is the perfect complement to your pool and home. Edgewater Design will put our expertise to work and help you draw up pool house designs to suit your specific personal and architectural needs. Whether you are looking at renovation of an existing pool house, or wishing to construct a new one, we will help. You have worked hard to afford your pool, so set it apart with a pool house design from Edgewater Design. Contact us today for a quote. Let EDC take the hassle out of building a pool house, give us a call with your questions at (480) 389-7114. EDC was founded by Matt Palmer, whose extensive experience in landscape and building design, along with earning a degree in horticulture, to design outdoor living projects that are visually stunning, environmentally conscious and practical. Our team is dedicated to surpassing the expectations of all clients we work with on every project – regardless of the size or scope. Our design team factors the exposure of existing structures and agriculture, size and scale of the property as well as your budget to create a pool house or casita that brings your vision to life. We’ve established an exceptional reputation for completing tasks like this on time and always within the budget and terms we set before engaging. By staying true to a proven process that includes discovery, planning and conceptional design, we streamline all aspects of the project, while placing an emphasis on details. Our process begins the minute you contact our team. We pride ourselves on open and clear communication with our clients. This not only builds mutual respect, but lays a solid foundation to establishing a professional relationship that is without hassle or conflict. 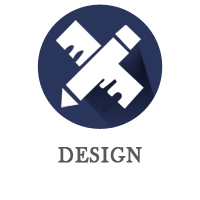 There are three areas we focus on that ensure your ideas and concepts are transformed into beautiful and functional finished products. Design Consultation: The best business owners are typically ones that listen to their customers. This is the purpose of the initial design consultation, so we can speak with you to learn your vision, goals, objectives, as well as clearly outline any hurdles, objections or concerns you have. By taking time to clear the air and layout the overview of this pool house or casita design and construction project, we minimize mistakes; saving you time and money. 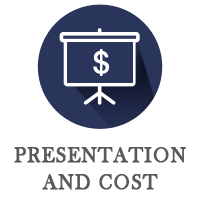 Presentation and Cost: Once we’ve clearly outlined the scope of the project, we then proceed to building a platform and plan that will ensure it is completed professionally, efficiently and within your time frame. We will provide you with an initial presentation and cost estimate that factors in design, construction and final inspection, so there are no hidden costs or concerns. Once we agree to the terms and sign contracts, we proceed to the fun part. 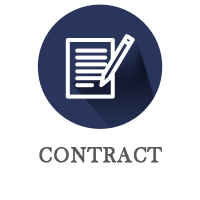 Contract: Our design team will create a detailed design and layout that incorporates all elements you requested for the pool house, or casita. When we agree on finished layouts and plans, we proceed to build it – communicating with you through the entire project. Once we’ve finished construction, we work with you on final inspections and even after the project is done – we follow up to ensure everything has surpassed your expectations. A proven commodity of any professional company is how well they are reviewed by previous clients. The fact that most of our business comes from direct referrals from clients we have built pool houses or casitas in the past indicates our dedication to superior service and exceptional results. We have built our reputation not by our words, but based on the quality of our work and clear and transparent communication with our clients. If you would like to learn more about the pool house or casita design and construction services in Phoenix give us a call at (480) 389-7114 or set up a design consultation today!